The late Unbridled's Song appears to have already clinched the 2017 North American leading sire title with Arrogate's rich back-to-back victories in the $12 million Pegasus World Cup (G1) and $10 million Dubai World Cup Sponsored by Emirates Airline (G1). Juddmonte Farms' 4-year-old juggernaut has grabbed $13 million in purses in two starts this year, raising his career earnings to $17,084,600. Now the richest North America-based racehorse in history, he is third among the highest earners worldwide behind Orfevre ($19,005,275) and Gentildonna ($18,468,392). But should we dismiss any competition for the leading sire title from Gainesway's Tapit, who topped the rankings for the last three years and set a North American earnings record each time? Not quite yet. Unquestionably, Tapit has a steep climb ahead if he's to be a serious challenge to Unbridled's Song. The 16-year-old son of Pulpit ranks fifth on the general leading sire list with $2,533,072 in earnings through March 25. He is the leading sire by both number of black-type stakes winners (8) and graded stakes winners (4). Tapit's earnings to date are tracking behind what his progeny had accumulated through March 25 in 2014, 2015, and 2016. At this point in 2014, Tapit's runners had earned $2,898,336. 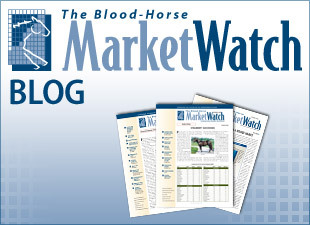 (Note that these earnings include direct conversions from native currency to U.S. dollars and does not have Hong Kong, Japan, and Singapore earnings on par with U.S. average purses as does the BloodHorse sire lists.) In 2015, Tapit runners had banked $3,566,935 in earnings, and in 2016, the earnings totaled $3,758,122. If Tapit's year mirrors how his progeny performed in 2014, then he's on track to finish the year with about $15.8 million in progeny earnings. Close but still significantly north of the $13,800,913 Unbridled's Song's progeny have earned through March 25. If Tapit's 2017 season unfolds like it did in 2015 and 2016, when he had earned a greater portion of his total earnings by March 25, then his end of the year total could be between $13.5 million and $14.1 million, which will not get the job done. It is worth noting that Tapit did not have either a Dubai World Cup winner or a Breeders' Cup Classic (G1) winner in any of his three record-setting years. His progeny could rally in the second half the year to give Unbridled's Song some competition. If Arrogate, however, keeps improving off his already peerless performances, then Unbridled's Song not only gets the leading sire title but could be in position to challenge Tapit's most recent earnings record of $19,245,198. Plenty of intrigue among the leading sires still lies ahead.